Fontina has a delicate, nutty, almost honey-like flavor. A slight tang asserts itself, but there is no acidic or bitter aftertaste. The finish of the Fontina is clean, yet complex. You’ll be fond of Fontina. 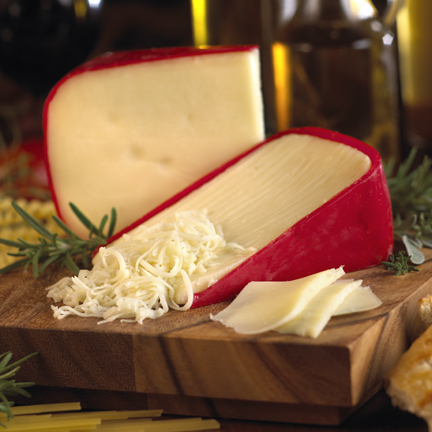 Fontina is believed to have originated in Valle d’Aosta, Italy—high in the Alps near the bordering France and Switzerland. Since this geographic area has been in constant flux, little-recorded history exists on the exact origin of Fontina. However, in 1951 at the Stresa Convention, it was declared that Fontina made in Valle d’Aosta, Italy with unpasteurized milk was indeed the original. Due to this declaration, cheeses made with pasteurized milk on an industrial scale should actually be called Fontal. Fontina is a semi-soft, pressed, and cooked cows’ milk cheese, which is molded into thickly rounded edge wheels. The outside of the cheese is coated in a bright red paraffin wax. The paste is smooth, slightly elastic, and straw-colored, with sparse, small round holes scattered throughout the cheese. Fontina is warm ripened for at least 30 days prior to shipment. 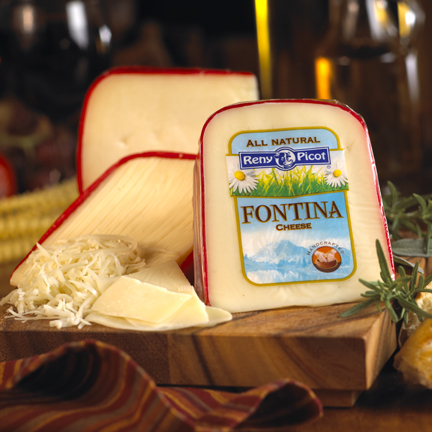 Fontina has a delicate, nutty, almost honey flavor. There should a slight tang but not an acidic or bitter aftertaste. The finish of the cheese should be clean. Ideal storage temperature is 40-45 degrees Fahrenheit with an elevated humidity of approximately 65%. Keep the cheese under refrigeration and wrap in waxed or parchment paper. Store in a sealed plastic container pierced with a few holes for air circulation. If the cheese appears to be drying out, place a clean damp paper towel in the bottom to elevate humidity.